One of the many wonderful things about paper flowers is that they give you the ability to display any flower during any season. 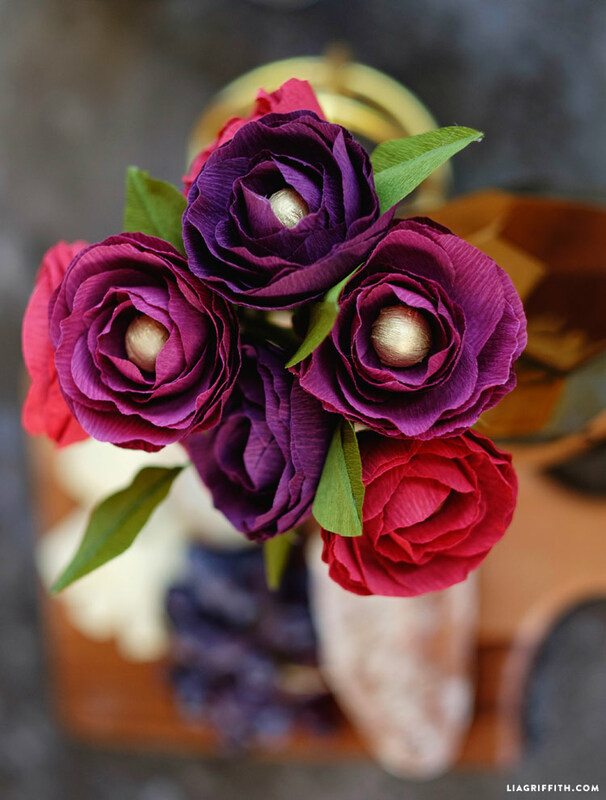 Ranunculus generally bloom in spring, but why not create a bouquet of these blooms in a gorgeous color palette for the colder months? 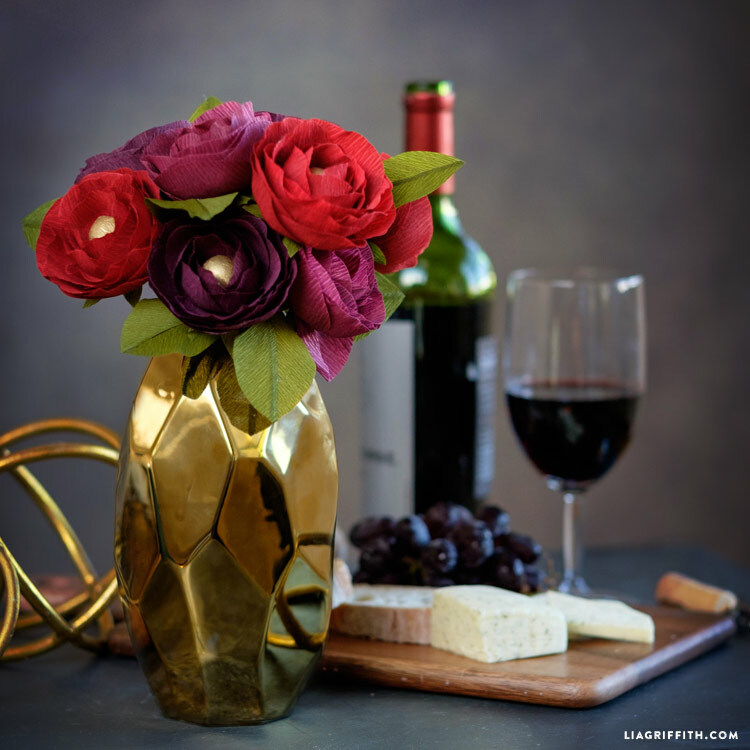 As you can see, they tend to pair well with a glass of full-bodied red wine 😉 Here I will show you my crepe paper ranunculus using the extra fine crepe for your fall and winter home styling. Start by gathering your materials. As always, you can find the crepe in the shop. 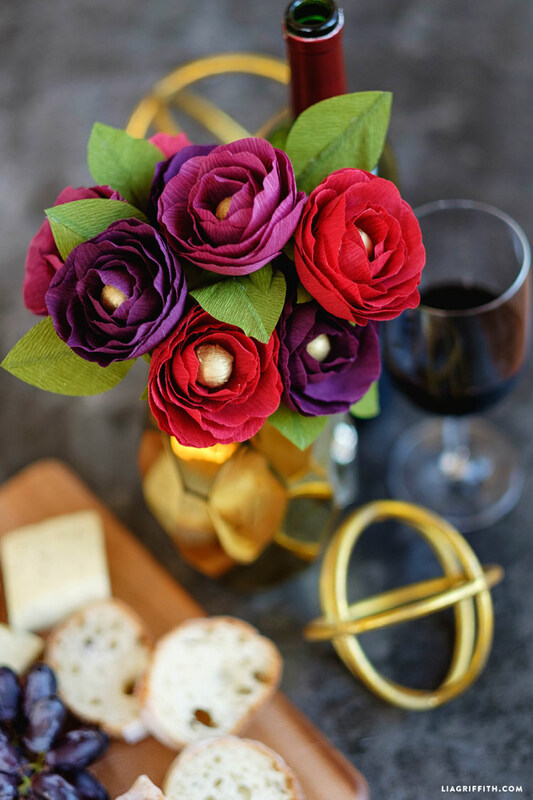 These crepe paper ranunculus are featured in Aubergine, Sangria and Cranberry with Gold centers and Cypress leaves. I have to say that these would also look stunning using our double sided paper if you want to create a larger variety of blooms. We used 18 gauge floral wire for the stems, and then wrapped them in floral tape to finish them. Download the printable instructions for a full list of materials. Cut out the PDF template and then follow the step-by-step photo tutorial for a visual guide. Crepe paper is a very forgiving material, and crepe paper ranunculus always turn out gorgeous no matter what skill level you are. So these flowers (as well as my anemones) are especially great for beginners! How can I become a Lia Griffith flower seller? Thanks! 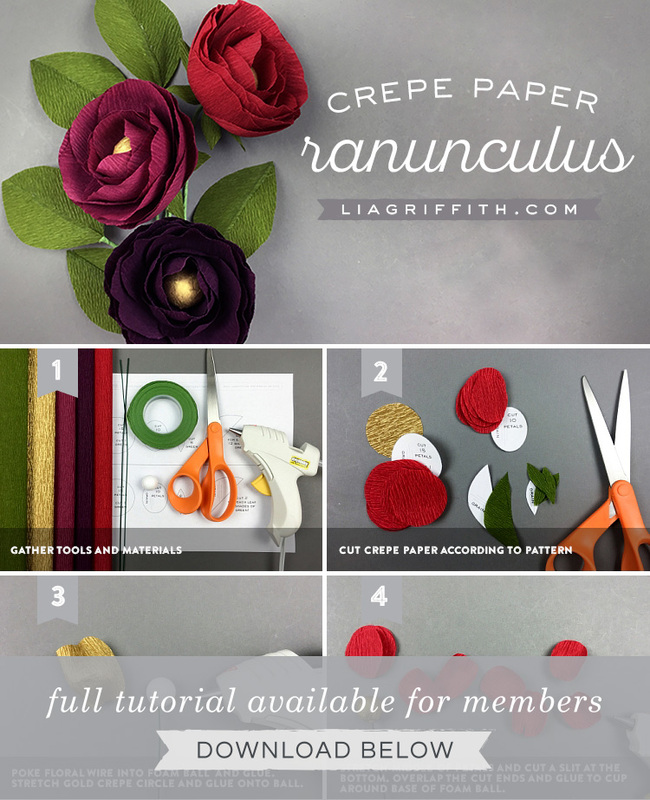 Lia – I have a Cricut Explore 2 and wonder if that machine will cut your crepe paper templates for petals and leaves? I realize the Cricut Maker can cut crepe paper, but not sure about the Air 2. No, the Explore Air doesn’t cut crepe paper 🙁 The Maker has a rotary blade that cuts crepe like butter. We used 3/4″ foam balls! So beautiful and elegant! I love these.